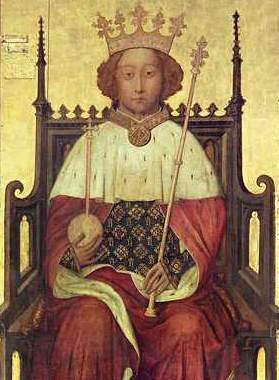 Richard II was King of England from 1377 until he was deposed in 1399. Richard, a son of Edward the Black Prince, was born in Bordeaux during the reign of his grandfather, Edward III. During Richard's first years as king, government was in the hands of a series of councils. Most of the aristocracy preferred this to a regency led by the king's uncle, John of Gaunt, yet Gaunt remained highly influential. At the onset of Richard's accession, and then for much of his reign, England faced various problems, which included the ongoing war against France (which was not going well for the English), border conflicts with Scotland, and economic difficulties related to the Black Death. A major challenge of the reign was the Peasants' Revolt in 1381, and the young king played a central part in the successful suppression of this crisis. In 1399, after John of Gaunt died, the king disinherited Gaunt's son, Henry of Bolingbroke, who had previously been exiled. Henry invaded England in June 1399 with a small force that quickly grew in numbers. Although he initially claimed that his goal was only to reclaim his patrimony, it soon became clear that Henry intended to claim the throne for himself. Meeting little resistance, Bolingbroke deposed Richard and had himself crowned as King Henry IV.